Thanks for surfing by. Can you smell the salt air and feel the soft breeze coming in from the waters of Port Stephens? You've sailed into Blue Water Paradise, the permanent home of 160 bottlenose dolphins, and port-in-passing for over 3000 migrating humpback whales. Nelson Bay Getaway accommodation is minutes from the beach and all the tourism attractions of Nelson Bay, the oldest of the villages nestled on the shores of Port Stephens on the North Coast of NSW Australia. 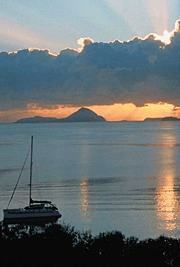 "We want you to enjoy your holiday experience in Port Stephens, and return time and time again." Nelson Bay Getaway beach house style accommodation has been designed for your comfort offering hotel room privacy with B&B hospitality. 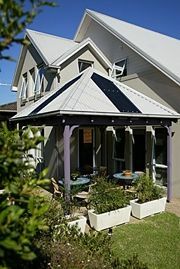 Each spacious room of this boutique bed and breakfast accomodation has a different style and ambience with your own private balcony or patio area. If you are looking for that ideal romantic getaway for couples only or accommodation for a small group of friends - Nelson Bay Getaway at Port Stephens on the NSW North Coast is for you.